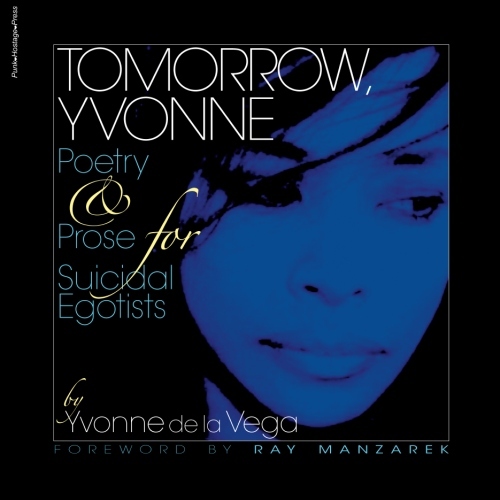 THE LOS ANGELES POETRY & MUSIC SCENE – Yvonne de la Vega was here. Throughout every resurgence of the spoken word in Los Angeles, LA Poetry has almost always been preferred by poet and listener alike, to be accompanied by music. In the late 1990’s on Vermont Avenue in artsy Los Feliz, The Onyx Cafe Sunday readings were like going to church. Under the organizational skills of LA Poet Milo Martin and company, there was a motley crew of musicians gathered at the front of the room ready to drum, blow, strum or plunk behind a poet in an accompaniment, intended to comp a poet’s spoken word piece, a rant by a performance artist, or a television personality dabbling with the cool of the LA Poetry scene. The magic of music as the universal language prevailed then as it does now, and is more than accepted here in Los Angeles but even more so, it is often preferred. Usually, every poet’s performance was satisfied at the Onyx, the audience having received a blessing that Sunday, with an anticipation for the next Sunday meeting of rants over rhythms. It was like going to church, and for many, it was Church. Spoken Word is more readily heard than merely tolerated when situated upon a set of beats. Simpler said, one poem delivered “dry” certainly comes to life when performed with music, it’s meanings hitting intended marks with more than the expected velocity. Imagery is quantized even, and attention spans stretched to lengths beyond any ever imagined. Even record executives took chances with the otherwise voodoo topic of “the spoken word”, as did Herb Alpert in 1991 with his “Jump Street” single that showcased spoken word and hip-hop. To go even further back in our city’s history of poetry and music, we have to recall the most revered of Los Angeles legendary rock bands, The Doors. When Jim Morrison showed Ray Manzarek some of his poems, he insisted to Jim that they should put together a band for him to sing his poems. Indeed his songs were constructed of poetry first. Today, Ray Manzarek continues to back poetry with his music such as beat poetry legends Michael McClure. Los Angeles is the Spoken Word & Music Capital of the World! Soon, you’ll be able to order it right here. For now, you can hear it on Reverbnation but the pages here are going to be FILLED with LA Poetry & Music. Oh yeah… You’ll be able to get The WordBeat Recordings here as well. Isn’t that sweet? On the sidebar, click on I ❤ LA to get back to homepage. That’s all the play I got for the day. Poetry’lectronica is a new genre I coined with interviewing Harlan Steinberger. You have to read about him he’s very talented. I will finish this tomorrow even though I’m posting it now. Tomorrow. Poetry and music is a beautiful combo. It is good to know that this particular art form is alive in LA since that way both forms of art can be nourished and continue to gain attention.